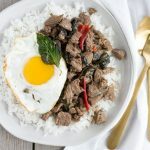 A Simple Stir-fry of just beef and Thai Basil, but bursting with so much flavor and spice. 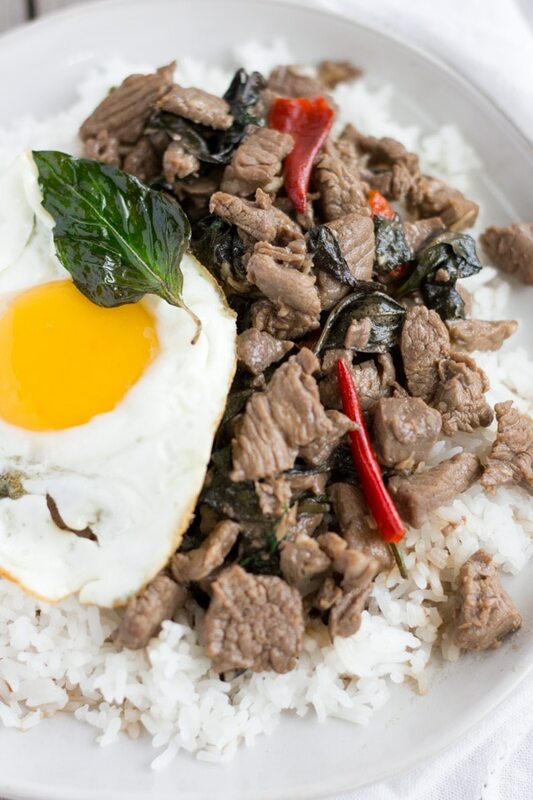 Always serve it with a crispy fried egg and you have an authentic Thai meal. This is one of my favorite dishes and I love the simplicity of Pad Kra Pao. 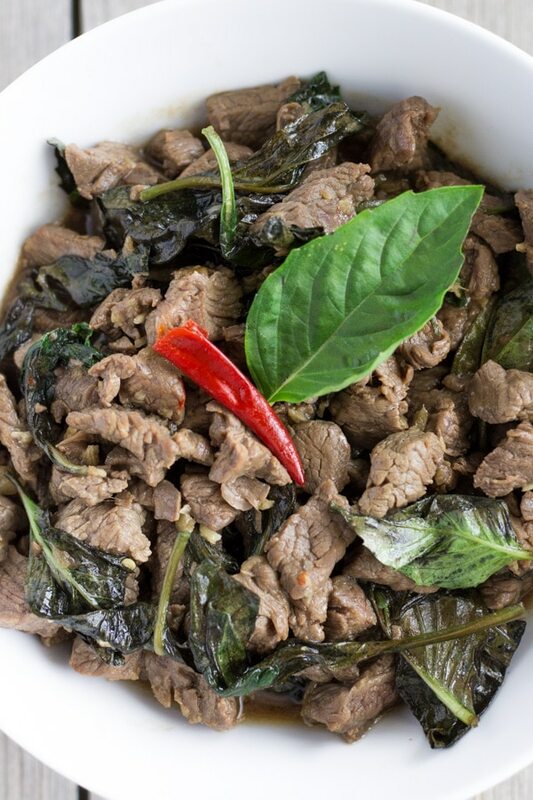 After several attempts, I perfected my Pad Ka Proa Neu recipe- Thai Basil with Beef. This recipe is what you’ll find on food carts in Thailand and it’s always very spicy! My previous post of Thai Basil Chicken is what’s commonly served here in restaurants. It’s still really good with onions, peppers, and veggies, but this version is much simpler and authentic. My hubby loves this dish and when we go visit my family we almost always have it for breakfast. Yes, we eat spicy food for breakfast! Another important note is the difference in Basil (Thai Basil, Holy Basil, and Italian Basil). For both basil dishes, I used Thai Basil, which can be found in Asian Markets. Thai Holy Basil is what the authentic dish calls for since the flavor and aroma is stronger and spicier. Holy Basil can be found in Asian Markets but is rarer to find. If Thai basil or Holy basil is not available, then you can use Italian basil, but the flavor profile will be different. The step I was missing in my recipe testing was marinating the meat. You don’t have to marinate for long, but it makes a big difference in the taste. I placed 1 tbsp of Oyster Sauce and 1 tbsp Golden Mountain Soy Sauce with the beef and let it marinate while I prepped the other ingredients. This is a fast dish, and you need to have everything prepped before cooking. This is pretty much a general rule for any stir fry dishes. Begin by heating up a couple of tablespoons of oil in a wok, then add the pounded garlic chili’s for about 10 seconds and add the marinated ground beef. Cook until almost done, then add the sauce mixture. Turn off the heat and add the Basil leaves. Super simple, right? This dish is best served with a crispy fried egg on top and jasmine rice. The runny yolk from the egg helps balance out the spiciness from the basil and peppers. 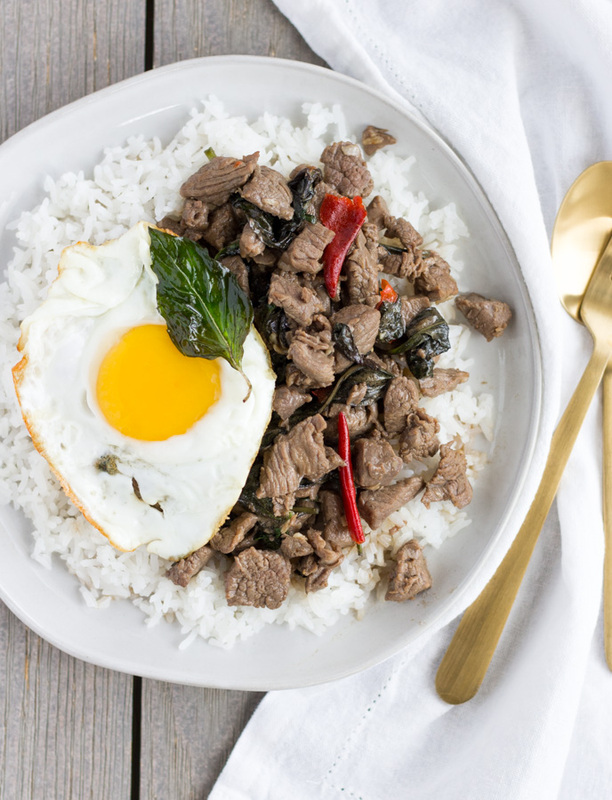 A Simple Stir-fry of just beef and Thai Basil, but bursting with so much flavor and spice. 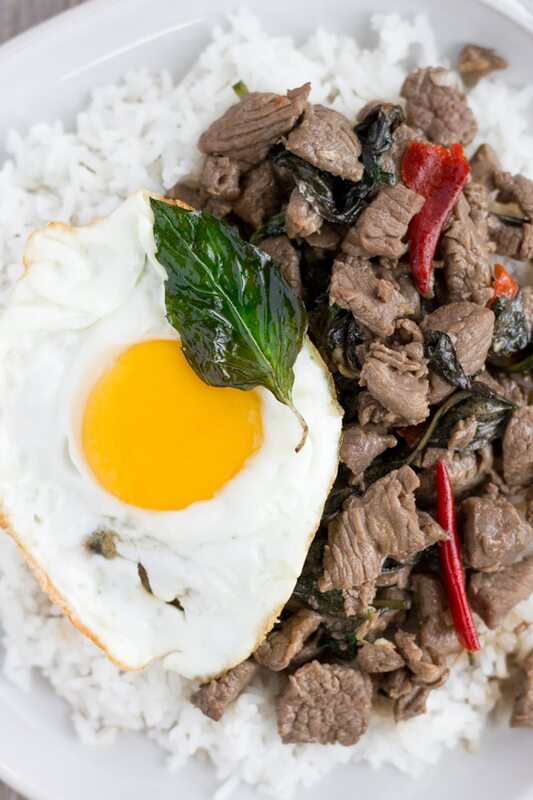 Always serve it with a crispy fried egg and you have yourself an authentic Thai meal. 4 Thai Chili's Depending how spicy the peppers are, this is considered hot. Marinate Ground Beef with Oyster Sauce and Golden Mountain Soy sauce, set aside and prep remaining ingredients. Pound Thai chili's and garlic in a mortar. If you don't have one, a food processor will do, or you can finely chop them. Wash Basil and remove from stems. Heat a wok over medium-high heat and add Oil. Saute chili's and garlic for about 10 seconds, then add Ground beef mixture and cook until almost done. Add remaining oyster sauce and soy sauce, stir well, then turn off the heat and add Thai Basil. If the sauce needs more juice you can add a little water. Taste and adjust seasoning. For each serving top with a crispy egg that's slightly runny and steamed rice.